Successful technology integration is more than just getting the tools into the classroom; here are some ideas on how to engage students and enliven your lessons with those tools. When technology integration in the classroom is seamless and thoughtful, students not only become more engaged, they begin to take more control over their own learning, too. Effective tech integration changes classroom dynamics, encouraging student-centered project-based learning. Think about how you are using technology with your students. Are they employing technology daily in the classroom, using a variety of tools to complete assignments and create projects that show a deep understanding of content? If your answer is "No," is it because you lack enough access to technology? Is it because you don't feel ready? Or do you feel ready, but need additional support in your classroom? Depending on your answer, your path to tech integration may look different from someone else's. However varied access and readiness may be, tech integration can successfully occur in any classroom. Handhelds Go to Class: Teacher Josh Barron and one of his students go through the strange-looking rite of "beaming" information to each other. The first step in successful tech integration is recognizing the change that may need to happen inside of yourself and in your approach to teaching. When any teacher brings technology into the classroom, he or she will no longer be the center of attention. The level of refocused attention will, of course, depend on the amount and the type of technology (e.g., mobile device, e-reader, laptop, interactive whiteboard) being brought into the classroom. However, this does not mean that the teacher is no longer essential to the learning process. While students may be surrounded by technology at home, it is dangerous to assume that they know how to use it for learning -- this is commonly referred to as the "myth of the digital native," and you can read more about it in this Edutopia blog post: "Digital Native vs. Digital Citizen? Examining a Dangerous Stereotype." Most students still need a guide to help them use digital tools effectively for learning and collaboration. As discussed in the What is Successful Technology Integration? section, how we define "technology integration" depends on the kinds of technology available and how much access one has to technology. This definition also depends on who is using the technology. For instance, in a classroom with only an interactive whiteboard and one computer, learning will still remain teacher centered and integration will revolve around teacher needs, which are not necessarily student needs. Still, there are ways to use an interactive whiteboard to make it a tool for your students. Even with one computer in the room, there are ways to integrate that one machine into your classroom and still make sure that you and your students are indeed doing things that you couldn't do before, not just doing the same things you did before in a quicker, more efficient way. Rural Washington Students Connect with the World: Pupils in Kristi Rennebohm Franz's classes have used the Internet for a variety of international exchanges and collaborative projects. Below you will find a quick overview with suggestions of what kinds of tools and activities are best matched with various levels of technology access. All of the resources linked to are either free or offer free versions. Try interactive websites such as BrainPOP. Dig in to Scholastic's whiteboard activities page. Show online videos related to the lessons. Check out the native software that came with the board. Use the videoconferencing tool Skype to connect beyond the classroom. Assign one student to be the class scribe and take notes. Start a collaborative class blog. Check out the Skype an Author Network website. Try Voicethread, a collaborative multimedia conversation tool. Let students access review or intervention materials on a rotating schedule. Curate resources for students via a Livebinder. Build a Google Site to house class content. Encourage skills practice, research, or the creation of collaborative stories using Google Docs. Record Screencasts for providing onscreen instruction. Find more free resources and ideas from this Eduptopia blog post. Encourage individual student blogging using Kidblog. Have students create digital stories using Voicethread. Explore student-created multimedia presentations using Microsoft PowerPoint, LibreOffice, Prezi, or Google Docs. Use Edmodo, Schoology, or Moodle to manage course content, assignments, and assessments. Get the students to create cartoons using ToonDoo. Have students make videos using Windows Movie Maker or Animoto. Build websites with students using Weebly or Wikispaces. Enable students to work through course content at their own pace through the use of screencasts, e-books, and other digital media. Use Poll Everywhere or Socrative to poll students. Start live class discussions with TodaysMeet. Explore enhanced digital note taking with Evernote. All of the above, whenever you want, for however long you like (especially if students take their laptops or netbooks home). Record group discussions using a voice recording app. Have students record themselves reading aloud for fluency checks. Assign student-created comics using the Puppet Pals app. Offer e-books for required readings. Upload and access course content using the Edmodo or Schoology apps. Foster skills practice using apps specific to subject area. Collaborate using apps like Whiteboard. Use them as multifunction devices (e.g., e-book readers, calculators, platforms for taking notes). Try out a tool like Nearpod to project information onto student devices. Check out mobile apps for student polling from Poll Everywhere or Socrative. What skills are applied to nearly all tools (e.g., saving a file, naming a file, finding a file, logging in and out of accounts)? Have your students mastered these basic skills? How many different tools will you introduce this year? How many is too many? How will technology help your students better understand content -- will it push them to a deeper understanding that could not have been achieved without technology? What level of integration do you want in your classroom by the end of the school year? What specific steps must you take to achieve that goal? What is a realistic goal based on time and resources? For more on levels of technology access and what that means for tech integration, read this blog post: "What Does 'Technology Integration' Mean?" You can also check out the outstanding Technology Integration Matrix produced by the Arizona K12 Center. It provides guidance on different levels of tech integration based on readiness and current practice, and offers links to sample lessons. Hold an introductory session with your students when introducing a new tool. Use the tool yourself first before putting your students in front of it. Have a plan for collecting student work. Communicate with other colleagues that may want to use the resources as well. Manage time with the resources wisely. Set goals for work completion with your students. Communicate with your administration about how and when you will be using shared technology. Get more details about these six tips from this blog post: "Six Tips for Teachers: How to Maximize Shared Resources." Once you have discovered what level of access you have and what possibilities this access affords you, it is time to address your own comfort level with the technology that is in your classroom. This can be achieved through self-assessment and/or the use of a fellow teacher or an instructional coach in your school or district. Once you know your comfort level, then you can begin to build a professional-development plan for yourself. This can be done alone, as part of your "grade team," or as part of your school or district's personal-growth plan. You can also begin to seek out professional-development opportunities online and outside of your district or school to begin to connect with other educators exploring the same challenges and seeking solutions. For more resources for taking professional development into your own hands, check out our DIY Professional Development page. It doesn't matter what your comfort level is with technology in your classroom -- without a continuous professional-development plan, you will never be as effective as you can be. Many schools and districts have made the mistake of placing technology into classrooms without a comprehensive plan for training teachers. Often, this technology sits unused or underused. If you are a teacher in a situation where technology has been "thrown" at you with no professional development, be thankful for the new tool(s) that you have at your fingertips -- and then do your best to learn about how they can transform and improve your teaching and have a positive effect on student learning. You can do this either on your own or by asking for help from your colleagues, mentors, or professional learning community. Unlike many other aspects of teaching, technology changes constantly. Just as in any industry, it is vital that educators stay current with new trends and developments in both pedagogy and new technologies. If you have a tech-integration specialist at your school, then use this person to your full advantage, as they are the front line for the tools you have or may want to bring into your classroom. While hardware and software vary across classrooms, schools, and districts, one thing can be guaranteed across the board: technology, no matter what kind it is, will fail. This inevitable part of tech integration is often the number-one fear of classroom teachers everywhere. Whether you are taking the steps to integrate technology into your classroom on your own or as part of a schoolwide or district initiative, this fear must be the first hurdle to overcome. Have a nontechnology backup plan. Just as we always tell our students that failure is OK, that we learn from failure, and that failure is part of the learning process, so must we, as adults, follow our own advice. Model troubleshooting with your students. Report the problem (and know to whom this reporting should be done). Ask for help. Have someone who knows how to fix the problem show you how for next time. One of the most exciting aspects of bringing technology into your classroom -- and into your students' hands -- is the enhanced opportunity for timely and meaningful feedback. Quick Checks: If you want to know if your students grasp enough of a particular concept before you move on, you can use tools such as Poll Everywhere, Socrative, or Mentimeter to get a quick snapshot of the class. By creating a short quiz or open-ended response question using one of these tools and having your students use an internet-enabled device to answer, you can get quick and easy feedback that will help inform your instruction. Personalized Feedback: Through the use of course-management tools such as Edmodo, Schoology, or Moodle, it is now possible for teachers to provide personalized feedback quickly and efficiently to their students. All three tools provide the ability for teachers to leave personalized comments and notes on student work, and they provide a messaging service for students who may want to send emails with questions or concerns about the course. Screencasts can also provide personalized feedback on student work. A teacher can record his or her computer screen while viewing student work, pointing out areas for improvement and areas where a student has excelled. Some great tools for this are Screencast-O-Matic and Jing. In addition, Evernote is a powerful note-taking tool that can be accessed through any Internet-enabled device through a web browser or the mobile app. It allows users to record audio notes, and it can be a great way to provide personalized feedback to students. Teachers can share these recordings, which are embedded in notes created through the app or website, with students through email. This can be a great way to keep students updated on their progress or to provide feedback on a particular assignment asynchronously. Because the feedback is recorded, students can also rewind and relisten for better comprehension or to refer back to if they like. Please note, all of these kinds of tools require that students have access to Internet-enabled devices on a regular basis and that they hand in their work digitally. For more on using technology to provide feedback to students, you can read this blog post: "Using Tech Tools to Provide Timely Feedback." Our students are constantly immersed in technology, yet that does not mean that they know how to use it for learning. We also cannot assume that they know how to use it responsibly either. 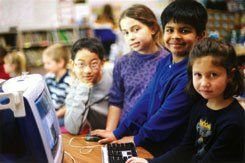 Just as we teach our children how to handle bullies on the playground, or as we admonish a student for copying someone's work and handing it in as his or her own, we must take the time to explicitly teach about cyberbullying, copyright, plagiarism, digital footprint, and proper conduct online. Of course, what we teach and how we teach it depend on grade level. We probably wouldn't teach first graders about the nitty-gritty details of copyright law, but we might teach them what kinds of information are safe or unsafe to share online. Likewise, while we may quickly review safe and unsafe information with high school students, we are more likely to focus on digital footprint and plagiarism. It is worth your time to spend some time early in the year setting expectations for online conduct, use of information found online, and staying safe when using digital tools. For more on teaching digital citizenship, you can visit BrainPOP, Common Sense Media, or Edutopia's Digital Citizenship Resource Roundup. Since it's clear that tech integration is here to stay, it is not a question of whether teachers integrate technology into their classrooms, but rather how to do it best. By taking small steps, teachers can begin to reap the benefits that technology can bring to their teaching and to student learning. This process does not have to be painful, and no one will become a tech-integration whiz overnight. However, even with limited access, with careful planning, some risk taking, and an open mind, teachers can successfully use technology to enhance their teaching and bring learning to life for their students. Continue to the next section of the guide, Workshop Activities.